THE BRITISH RAILWAY STORIES LTD: "Sample Artwork"
In between scenic work for the next episode of The British Railway Series, I have been working behind the scenes with a publisher and artist for my book. 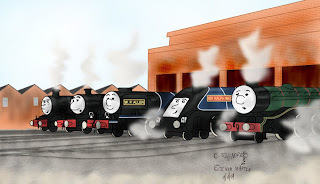 Here is a sample piece of artwork, created for me by Chris Signore of the Sodor Island Forums. Seen above, it is simply superb work, and I am in no doubt I will be returning to Chris for some more artwork towards the prototype copy of my first book.